’s crisis over alleged manipulation of U.S. emissions tests threatened to engulf its global business as European regulators put the German auto maker in their cross hairs and the U.S. launched a criminal probe into the matter. Its shares plunged as much as 20% on Monday in the wake of the U.S. Environmental Protection Agency’s disclosure last week that the company could face fines of as much as $18 billion for allegedly manipulating exhaust-emissions tests. Volkswagen acknowledged that it installed software in some diesel-powered cars to make it appear that the cars met tough U.S. anti-smog rules, the EPA said. Volkswagen hasn’t contested the EPA’s statement. The company issued a sweeping apology for breaching consumer trust over the weekend, but hasn’t publicly admitted to manipulating test results. The U.S. Justice Department’s Environment and Natural Resources Division has begun an investigation into the alleged cheating, people familiar with the matter said. The U.S. House oversight and investigations subcommittee on Monday said it planned to hold a hearing in coming weeks. and PSA Peugeot Citroën also fell in Europe. “We are worried that the justifiably excellent reputation of the German car industry and especially Volkswagen will suffer,” said Sigmar Gabriel, Germany’s Economy Minister and Vice Chancellor. 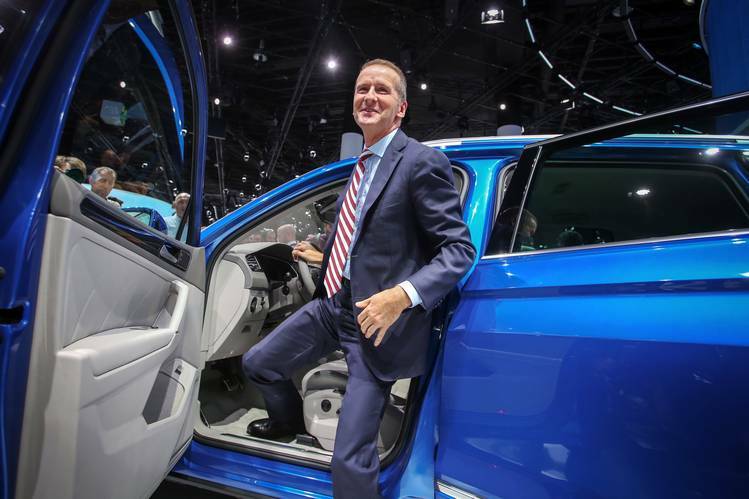 Herbert Diess, head of Volkswagen’s passenger-car brand, canceled plans to attend a New York event on Monday for the company’s new Passat sedan, a spokeswoman said. In Germany, the scandal pushed Europe’s refugee crisis from the top spot on TV news and the government launched an independent probe of Volkswagen’s diesel-powered cars in that country. “We are facing a case of blatant consumer deception and environmental damage. I expect VW to reveal, without any gaps, how and to what extent these manipulations have taken place,” said Jochen Flasbarth, Germany’s deputy environment minister. The European Commission, which has fought the region’s auto lobby for greater restrictions on diesel engine emissions, said it contacted Volkswagen management and U.S. authorities, but added it was too soon to launch an investigation of its own. “We are taking the matter very seriously,” said Commission spokeswoman Lucia Caudet. The manipulation of routine emissions inspections of diesel engines could encourage tougher European Union legislation on diesel, analysts said. In Seoul, an official at the Ministry of Environment said the South Korean government plans to conduct emissions tests in mid-October on three VW models—the Golf, Jetta and Audi A3 sedan—and would issue a recall order if the car maker is found to have cheated on air-pollution standards there. A Volkswagen Korea representative declined to comment. The EPA and California’s regulator are screening diesel-powered vehicles from other auto makers for possible defeat devices used to cheat on emissions tests, Christopher Grundler, director of the EPA’s Office of Transportation and Air Quality, said on Monday. Mercedes-Benz, the luxury car maker owned by Daimler, said it was unaffected by the emissions scandal and that it didn’t use such software to manipulate tests. French car makers Renault and Peugeot Citroen do not sell cars in the U.S., but about half their global sales are of cars with diesel engines. Renault is considering holding demonstrations to prove that its diesel-powered cars meet European emissions standards, a person familiar with the situation said. Peugeot said the company obeys the law wherever it operates and stands by the emissions reports of its diesel cars. “The market is expecting that this issue is not limited to the U.S.,” said Ingo Speich, a fund manager at Union Investment, which owns less than 1% of Volkswagen. The EPA investigation triggered a lawsuit. On Friday, lawyers filed a lawsuit seeking class action status against the German auto maker in a federal court in California that accused the company of fraudulent concealment, false advertising and violating consumer rights laws. The suit alleges customers paid premiums for Volkswagen and Audi cars powered by clean-diesel engines on false promises of horsepower and fuel efficiency, and that their vehicle values will now suffer as a result of the EPA probe and any recall. The suit was filed by plaintiffs’ lawyers including Steve Berman, who is co-leading consolidated litigation in New York against General Motors Co.
over faulty ignition switches. A Volkswagen spokeswoman declined to comment on the lawsuit. Volkswagen’s supervisory board, which oversees the company, will discuss the emissions scandal when it meets on Friday, a person familiar with the situation said. Volkswagen’s controlling investors Porsche Automobil Holding AG, which holds the shares owned by the powerful Piech and Porsche families, and the German state of Lower Saxony said it was too soon to pass judgment on Chief Executive Martin Winterkorn or make any decisions about management. Mr. Winterkorn on Sunday said the company was cooperating with authorities and has commissioned an external probe. He vowed to do “everything necessary” to regain public trust in the company. Analysts said if Volkswagen was shown to have cheated to get better emissions results, it could undermine its U.S. recovery and further weaken its shares, which are down 37% from their peak on March 16.Wolfsburg, Germany-based Volkswagen’s shares fell €27.65 ($30.96) to €133.70 in Frankfurt trading on Monday. Several analysts downgraded their ratings on the stock. Consumer Reports, an influential magazine when it comes to car reviews, last week suspended “recommended” ratings on the auto maker’s Jetta and Passat diesel-engine models after the EPA disclosed its allegations. Consumer Reports said the recommendations would be suspended until it can retest the vehicles once they are repaired. The magazine said it would then assess whether the cars’ fuel economy worsened. Laurie Cleveland, a 54-year-old English teacher from Lowville, N.Y., said she bought a new 2015 VW Passat TDI over the Labor Day weekend. She isn’t sure what to do now. She said it is her fourth Volkswagen diesel car since 2006. “I feel like I’ve been deceived,” she said. “I’m a person who likes to be environmentally friendly,” she added. 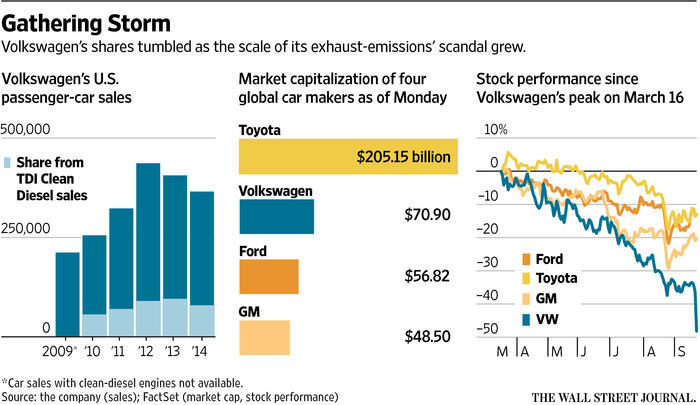 The U.S. is crucial in Volkswagen’s efforts to become the world’s leading auto maker by sales. The German company has built its campaign to grow in the U.S. market on a promise that its clean-diesel engines deliver better performance and low emissions. It is neck-and-neck in global sales volume with reigning leader Toyota Motor Corp.
and overtook the Japanese car maker during the first half of this year. But the emissions test probes could stall its progress there, said analysts. Even before the emissions issue, the auto maker’s namesake Volkswagen brand has been battling declining sales in the U.S. market. And Audi, its luxury car brand, is finding it hard to catch up in the U.S. sales race with rivals BMW and Mercedes-Benz. U.S. officials said Volkswagen violated two parts of the federal Clean Air Act and could face fines of as much as $37,500 per car, or more than $18 billion. It remained unclear on Monday whether the U.S. government would seek such an onerous penalty. The EPA in November 2014 hit South Korean auto makers Hyundai Motor Co.
with a record $100 million penalty for overstating fuel-economy claims and forced the companies to cough up another $200 million in regulatory credits. Officials alleged that Volkswagen used software that activates full exhaust emissions controls only during testing but then reduces their effectiveness during normal driving. The result is that cars can emit nitrogen oxides at up to 40 times the allowable standard, the agency said. Diesel-powered cars are a small part of overall U.S. car and light-truck sales. Experts say that the software enables cars to get better fuel economy at the expense of higher nitrogen-oxide emissions, which was likely one reason VW was using them, according to Margo Oge, who recently retired as director of the EPA’s Office of Transportation and Air Quality after more than 30 years at the agency. The state of California is separately investigating the auto maker. The International Council on Clean Transportation, a nonprofit research organization that works with governments to cut air pollution from mobile sources, and West Virginia University researchers uncovered Volkswagen’s alleged use of defeat devices in research and testing in the last couple of years. Bloomberg News earlier reported the Justice Department probe. and Mike Spector contributed to this article.